Following the decision by the Global Fund to take over supplying bed nets for the Solomon Islands which had previously been supplied by RAM through the Adopt A Village program (AAV) it was decided to use the AAV funds and new donations received, to provide tools to villages to enable them to keep their villages free of mosquito breeding areas. The program is called “Healthy Villages”. Under this scheme, villages develop a plan of work to be undertaken and then apply to the Health Promotions Director (Solomon Islands Ministry of Health) and are required to sign an agreement that they will look after the tools. Once approved and tools purchased they are then collected by a representative of the village and transported to the village. The first tools were provided to 30 villages in 2013, a further 38 villages have been provided with tools in 2014/15 at a cost to RAM of AUD$ 106,000. By mid-2017 a total of 160 villages had been provided with tools for a total cost of AUD$200,000. 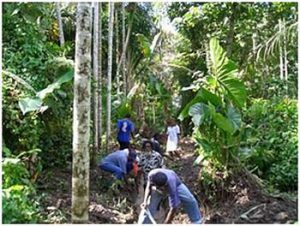 Funding has also been sourced locally with contributions from The Solomons Forest Association. We have received a request from a further 81 villages for tools at an estimated cost of $142,000. RAM is currently fund raising to meet this need and expected extension as more new villages are approved. 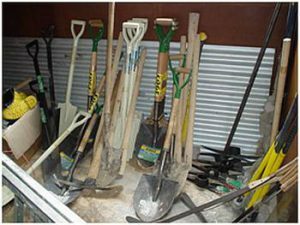 Bush knives, brush knives, axes, flat files, spades, mattocks, metal rakes, crow bars and wheelbarrows. Although further monitoring and evaluation needs to be done on the success of the program the feedback from the villages has been good with comments that they do not need to use bed nets as there are no mosquitos. We also know the program has been very successful in Isabel province where the incidence of malaria is now very low and malaria elimination programs are currently underway. This truly is a sustainable self-help program. Healthy Villages is supervised by PDG Wayne Morris OBE of the Rotary Club of Honiara. RAM has plans to introduce this program into other countries, where we work, as another tool in the strategy to eliminate malaria. In 2016 the Rotary Club of Dili Lafaek in Timor Leste adopted RAM Healthy Villages as their major Club project and have serviced 12 villages so far.